My wrist is hurting. It happens occasionally as I have hypermobile joints. Hypermobility doesn't hamper me much in everyday life - I just struggle to open jars and my balance is a tad wonky. I do have recurrent problems with my hands and wrists: constant knitting and typing will cause RSI in most people, of course, but I am particularly susceptible. So what is a girl to do when deadlines are looming and there must be knitting? She pauses. I have taken two days off from knitting and tried to avoid using my hands too much (*fidgets*). Instead I have polished off a few books, begun reading another, and I've celebrated my mumble-mumble birthday. 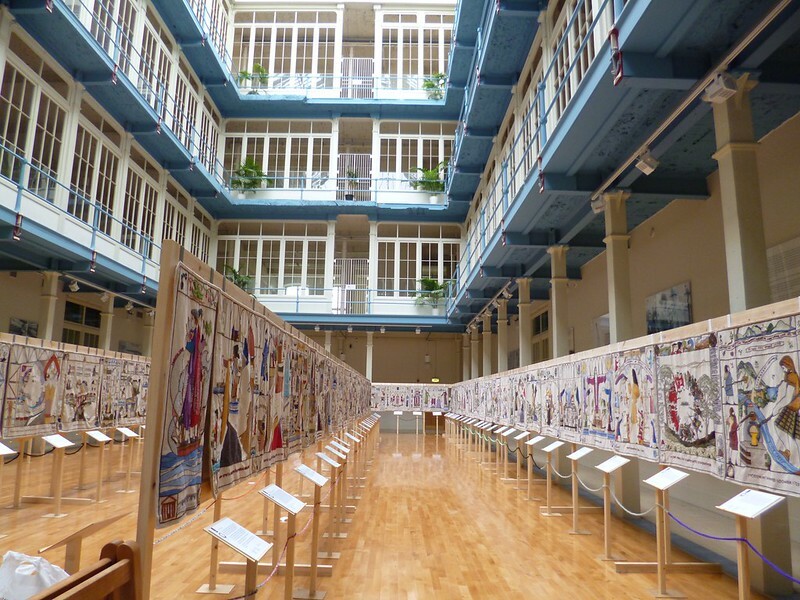 My man and I went on a jaunty little trip to Edinburgh to see The National Museum of Scotland's special exhibition on Vikings. The exhibition was mainly made up of finds from a handful of Swedish high-status settlements - interesting to me since I am so familiar with every day Danish Viking finds, but also inexplicably never really explained by the exhibition itself. The lay-out was also odd as most displays could only be viewed by one or two people at a time (we waited between five and seven minutes between each display case). 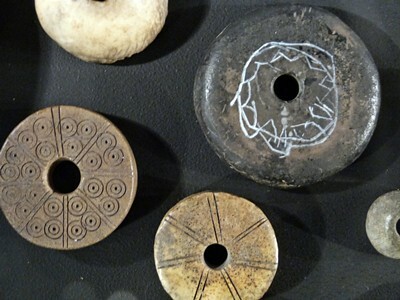 But the spindle whorls were pretty. For me, the Vikings feel so modern and seeing needle-binding (again, not explained), dyeing, spinning and weaving tools just felt so .. natural. These methods are still in use, the tools are the same and we all like a bit of ornamentation on the tools we use the most. Post-birthday the world seemed to pause and snow came tumbling down. I went out to take photos of a recently finished knitting object (and some other things but I cannot show you those). But I was stopped in my tracks. 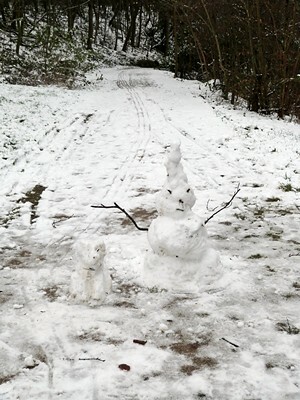 A trickster snowman and his dog (bear?) had been built on the pathway. I loved them. Sinister, menacing, and melting. I did manage to take some photos but taking photos of scarves are really difficult when your Official Photographer is at work and the snow had already begun to turn slushy. 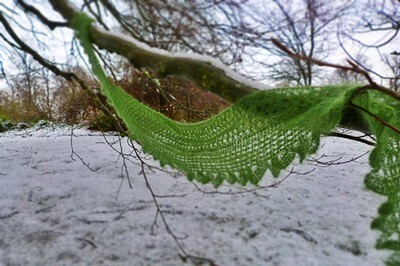 Sarah Hatton's lovely Edith shawl/scarf knitted in Rowan Kidsilk Haze in the colourway "Fern". I have long been wanting to knit it and since I have been working on some knitting maths lately (pro tip: never use a stitch pattern running over a prime number as your base unit), I wanted to try out Sarah's pattern because I knew her numbers would work beautifully. And I wanted the scarf too, of course! I went slightly off-pattern thanks to external distraction and the end result is soft, beautiful and a great deal more lacy than it should have been. It was a joy to knit. I love Kidsilk Haze so much. Finally, a big thank you to my friend Paula who gave me a beautiful birthday present: two hand-stitched pendants made from silk with gorgeous, delicate flowers embroidered on top. 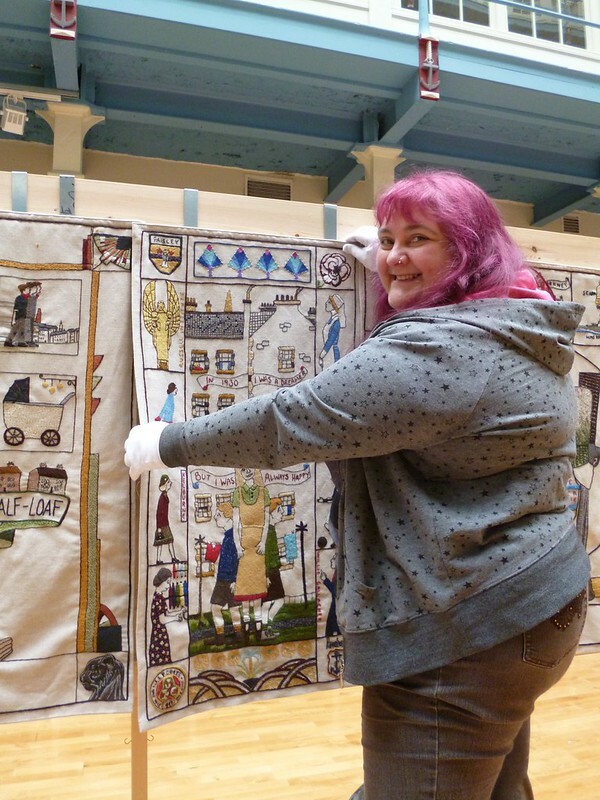 I feel truly honoured to count some amazing crafters as friends and few are as talented as Paula. Paused. Some time to think. Snow here and then gone. Kind gestures from people. I like my life like this. "Did you see the 'knit your own sheep' thing outside?" - "I am not sure I want to know.." Dave and I are creatures of habit and we have frequented the same little antiques shop for years. We have come to know the guys running the place quite well: they ask me how to thread a vintage sewing machine, we bring them tea, and the banter is always exquisite. Occasionally I go home with vintage buttons. However, the guys are also very good at pulling practical jokes and I thought the 'knit your own sheep' remark was one of them. Then I saw what they had put aside for me. "Are they knitting looms?" one of them asked. No, not knitting looms. "I saw them in the house - this 1930s place up north - and I thought of you," the other one said. "They're yours if you want them." And so this afternoon I became the proud (if bewildered) owner of two pre-WW2 woollie horses. They both bear brass plaques marking them out as Tulloch of Shetland woollie horses. The only thing I have been able to discern is that the V&A have a Tulloch of Shetland woollie horse in their collection (identical judging by the description? I am basing my dating upon them, incidentally). Anybody able to shed more light on this company? 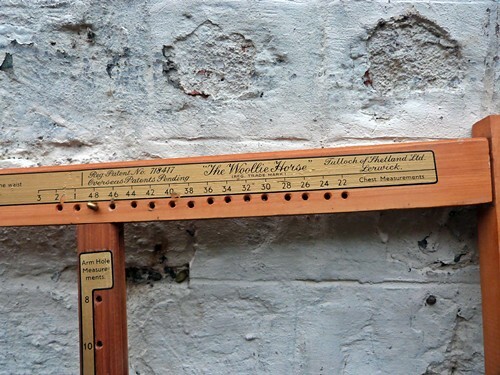 So, what is a woollie horse? It is more commonly known as a jumper stretcher or a jumper board. You use them to quickly dry wool jumpers and stop the jumper stretching out of shape whilst drying. They are still being manufactured - Jamieson & Smith sell them - and are said to still being used extensively in Shetland. Seeing as I would not use two woolie horses, I have given the second one to Ms Old Maiden Aunt. It will feel right at home in her shop window.